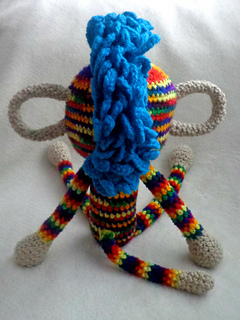 This pattern makes a durable and adorable monkey friend whose ears are handles, so he can “Come-Along” wherever your child goes. 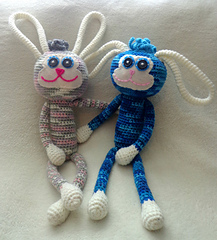 Attach your child’s favorite ring toys to the ears or hang him on the stroller or curtain rod in the nursery. 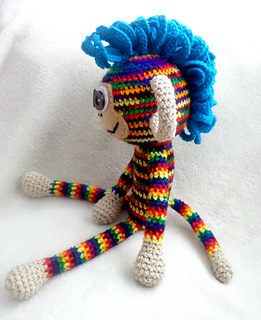 His mohawk is “crochet as you go”, so there is no cutting yarns, sewing or weaving in endless ends! The mohawk is great for little fingers to mold and play with! 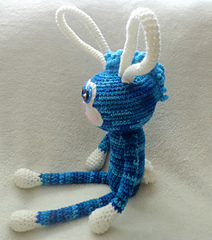 It also includes mods to make the “Come-Along” Funny Bunny. Beige (or any solid for hands and feet), Mexicana (or any variegated, multi-colored for body), Turquoise (or any Mohawk/hair color), 2 Buttons for eyes (3/4” or smaller) They don’t need to match! Odd is Funky and Fun!, White Felt for eyes (or color of choice), Light Brown Felt(or any solid color) for face, Black or Pink yarn or embroidery thread for facial details, SHARP tapestry needle for working felt, Scissors, Polyfill Stuffing & Stitch Markers. If you have any questions or require assistance, please do not hesitate to contact me.